A conversation with Carol R. Bradford, M.D. Carol R. Bradford (M.D. 1986, Residency 1992) has spent her entire academic and medical career at the University of Michigan, and, beginning in July, she will take on the newly created role of executive vice dean for academic affairs. Since 2009, Bradford has served as chair of the Department of Otolaryngology-Head and Neck Surgery and is currently the Charles J. Krause, M.D., Collegiate Professor of Otolaryngology. 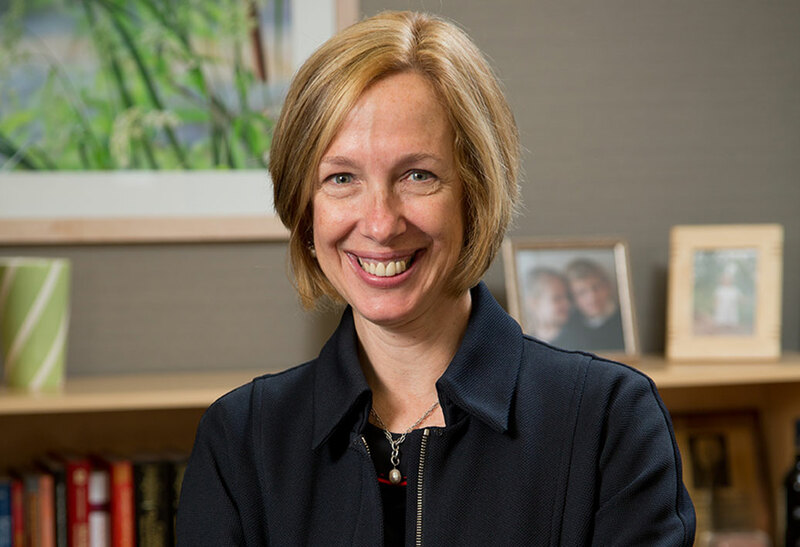 Her new position is one of the key leadership roles under a U-M Health System and Medical School reorganization led by Marschall Runge, M.D., Ph.D. Already the executive vice president for medical affairs, Runge recently became dean of the Medical School. He has appointed David Spahlinger, M.D., as executive vice dean for clinical affairs and president of the clinical enterprise. A search to fill the new chief scientific officer role is underway, as is one to appoint a chief information officer. Bradford will be primarily responsible for the educational portion of UMHS’ tripartite mission: research, patient care and education. During a recent interview, Bradford discussed her career at Michigan and her new role. Below is an edited version of the discussion. What is your approach to leadership in your department, and what will it be as vice dean? My approach is to hear all sides of the story. Then, many times, I end up putting everybody in the same room to talk it out. I believe that everybody's opinion really adds value. If you get the broadest input, you'll come up with the best solution most of the time. How do you avoid the morass of not making a decision? I agree that that's the challenge. I think that hasty decision-making is to be avoided, because you can make the wrong decisions without proper input. Never making a decision and never executing is probably even worse. You need a timetable by which you make the decision. You have a period of input, you set up the meetings and not everybody may be in full agreement. At least you've had those conversations, and you've garnered what I call "key stakeholder" input. Then you move forward. Every decision you make won't be perfect. A few things you decide to do might not be right, but it's not like it's etched in stone forever. You have to make decisions and move forward. The Medical School is implementing a new curriculum. Will that implementation continue as you begin your new role? There is a bold new curriculum that is being implemented, and one of my roles as a leader is to ensure its successful implementation. I think that’s really exciting … Medicine is rapidly changing. If we don’t evolve with the rapid change, then the Medical School training will become irrelevant … We’re in the information age. It is no longer essential for students to know every piece of information because it is so available. It’s at your fingertips anywhere on Earth. As we talk about the information age and the volume of information, another important thing to consider is how do the physicians of the future — I should be more broad — the health care providers of the future manage flow of information, manage hundreds of emails a day? I worry a lot about balance in life and burnout. I really believe that we have to also help our faculty, staff and trainees learn balance, and mindful, healthy living. Nobody can work 24/7. How is the Medical School different now than when you attended? The core of the Medical School — a dedication and commitment to extraordinary teaching and preparing physicians for patient care and leadership — hasn't changed. The way we teach it has completely changed. Nowadays, everything is online. The lecture halls aren't very full because [lectures are online] and you can speed them up and watch them at your convenience. I worry about the community impact of that, but that has been replaced by small group learning and M-Homes [small learning communities created within the new curriculum]. I think the community of students is really important. The school has changed, but we still learn lots of facts. You still need to know anatomy; you still need to know histology, pathology. What I think is very cool in the new curriculum is integrating basic science with clinical medicine. Our curriculum was very subdivided. The first two years were in the lecture halls — all the basic science. The last two years were purely clinical. I think it's fun to get some clinical interaction earlier in the educational process. You plan to maintain some of your clinical activities. Why are you continuing in the clinic? I do head and neck cancer surgery. I've been in practice since 1992. I have a long list of patients who trust me and rely on me for their cancer follow-up and surveillance. A week ago, when [Bradford's position was announced], every patient came in to see me and their first question was, "Will you still be my doctor?" I said, "Yes, I will." I think it keeps me relevant. I think that you best understand the challenges of the students, the trainees and the providers when you, yourself, are doing the work. It would be almost impossible for me to give up patient care. I just think it's who I am. I love being a doctor. I love caring for patients and families and training the future providers. I just don't think it's something I could leave.